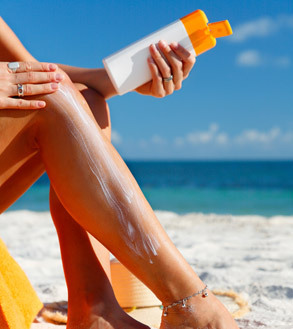 When exposed to sunlight, the skin would usually darken from both UVA and UVB rays. UVA rays make up the most of the UV radiation reaching the Earth’s surface. UVA rays are equally intense throughout the day and penetrates clouds and glass. UVA rays also penetrate the skin more deeply. UVB rays are more intense when the sun is high up in the sky (10am – 4pm). UVB rays are blocked to some degree by glass. Why does the skin darken under the sun? Although skin darkening under the sun may lead to unwanted cosmetic issues such as hyperpigmentation and an uneven skin tone, the skin’s darkening reaction under the sun is actually the body’s way of protecting itself from UV radiation. By raising the amount of melanin (dark pigment) in the skin, it is better able to absorb UV radiation and protect the skin from DNA damage. 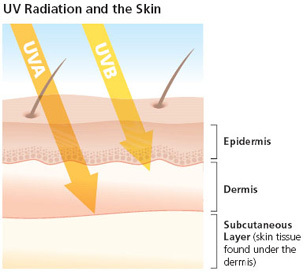 Both UVA and UVB rays cause damage to our DNA. However, UVB rays are more harmful and more likely to cause skin cancer than UVA rays as our bodies are able to repair the DNA damage caused by UVA rays (Source: Federation of American Societies for Experimental Biology). Why is it that some suntans fade quickly while others last for a long time? The difference between temporary and more permanent skin darkening is probably due to the length of sun exposure and the type of rays the skin is more exposed to. Immediate skin darkening or tanning occurs within minutes of sun exposure. The darkening is temporary and usually reverses within a few days. In contrast, delayed skin darkening or tanning caused by UVB rays develops within 2-3 days (72 hours) after sun exposure and persist for a long period of time. Sunlight oxidizes glutathione in the skin into its disulfide, which increases the amount of dopaquinone available for melanogenesis. Sunlight transforms the fats under our skin into Vitamin D. We only need about 15 minutes of sunlight to get enough Vitamin D.
Dark-skinned people have more natural protection against sunlight. Thus, they tend to age much more gracefully and appear younger than their paler counterparts. Eating food that is rich in beta-carotenes (eg. sweet potatoes, carrots, oranges, vegetables) can protect us from the sun damage. This may be because UV rays activates the HO-1 gene, which promotes skin inflammation, but beta-carotenes can suppress this activity. Sunlight has an amazing ability to lift up our moods and affect our emotional health. Next PostNext Dermal versus epidermal hyperpigmentation: How deep does the melanin go?